The 8th edition of Hiperorgânicos – International Symposium on Research in Art, Hybridization, Biotelematics and Transculturalism, will take place between the 22nd – 27th of May 2018. 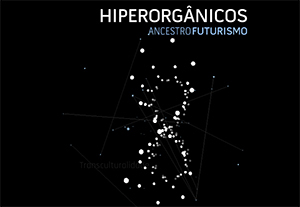 Hiperorgânicos is an idealization of the Nucleus of Art and New Organisms – NANO – coordinated by the artists researchers Prof. Dr. Guto Nóbrega and Profa. Dr. Malu Fragoso, headquartered at the Federal University of Rio de Janeiro/UFRJ, city of Rio de Janeiro. This year the chosen theme is “Ancestorfuturism”. 22nd to 23rd – Presentations selected from an open call at the Museum of Astronomy and National Observatory with the participation of artists, scientists, researchers and representatives of ancestral traditional Brazilian cultures. 24th to 26th – OpenLab – telematic scope through data server for artistic processes developed at the Laboratory at the Museum of Tomorrow. For the 2018 edition, under the theme Ancestrofuturismo, the Hiperorgânicos seeks, through dialogue and artistic experimentation, ways of reconnection between past and future to rethink the present. To this end, it will pay special attention to spatial culture as an investigative form of new models and discourses that motivate urgent / emerging actions. Reperspectivating our nature under angles of the biospheres, the cosmos and the subtle connections between ancestral knowledge and data mining, fostering interconnected, dialogical artistic experiments from the perspective of organic and coherent processes, inspiring new unlikely creative processes in the form of an open laboratory , are some aspirations of this event.